People in Athens are reliving their youth at a pinball museum opened by a devoted fan of the game. It was hugely popular in Greece, but the craze died out 20 years ago with the rise of computer games. Nestled on a side street near the Acropolis, the Athens Pinball Museum is home to 100 fully functional machines which visitors can play, dating from the 1950s. Founder Panos Bitarchas, 47, who opened the museum six months ago, says it attracts all ages, as tourists, but is a particular draw for those who grew up in arcades and come looking for specific machines they remember. He explains: "People come in searching for the first pinball they played. When they find that they go directly there because it is the last memory they had from their childhood. It's nostalgia, it's the sounds, it's the smell." 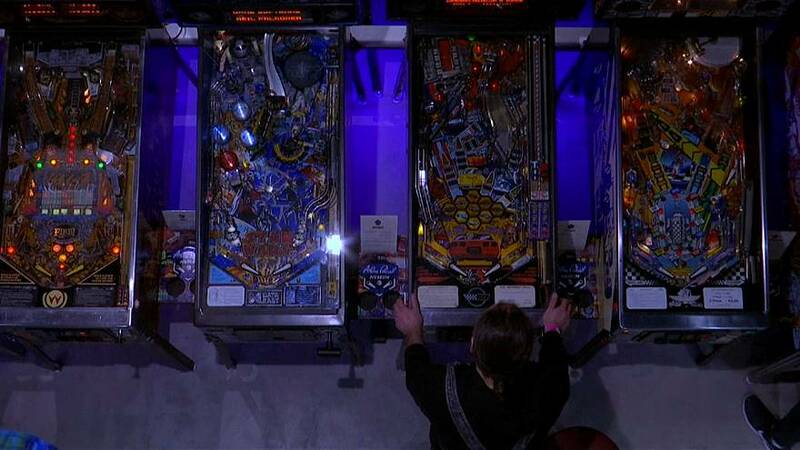 Sixty-five-year-old Michalis Kelemenis said he rushed to the museum as soon as he heard about it and didn't want to leave, having not played pinball since the 1980s. "I became a child again, [I feel like] I am 30 years old again. I am having a great time," he said. Thirty-nine-year-old Vasso Kostopoulou brought her 11-year-old son Anargyros. She said: "It is a truly great feeling to see it again and relive it again because there are now electronic versions but it's not the same thing. "We are teaching our son about flippers, so he can learn how games started, how they developed into video games." Bitarchas says in an age of smartphones, tablets, and video games, pinball machines are foreign to children and they are afraid they might break them. he has removed the coin operation slot from all the machines in the museum, wanting people to feel free to play. Visitors pay only a general admission charge. The idea for the museum came to Bitarchas when he received a pinball machine as a gift from his wife Chrysanthe, a Greek-American, in 2017. He had not played pinball for 20 years. That machine, a 1993 Bram Stokers Dracula, sits in the museum today. Leaving behind a career in the renewable energy industry, Bitarchas began scouring the Greek countryside for almost a year, following a trail of closed-down arcades and digging out dusty old machines from warehouses and having them restored. Bitarchas says the machines are a chronicle of pop culture and history, as well as historical events. The 1958 "Satellite" pinball machine by the Williams Manufacturing Company marks the first United States satellite launch, while the "Taxi" machine by WMS Industries from 1988 features an illustration resembling former Soviet leader Mikhail Gorbachev. "We can see here Gorbachev, perestroika, it was a very important time for the western world and what happened, we can see it in this pinball machine. "It's like art for my generation... classical things don't excite me. It's like other people watching paintings," says Bitarchas. Is Airbnb 'pricing out' residents in an Athens suburb?